The restored Archaeological Museum of Kos was inaugurated on Sunday by Culture Minister Aristidis Baltas and regional governor of southern Aegean Giorgos Hatzimarkos. 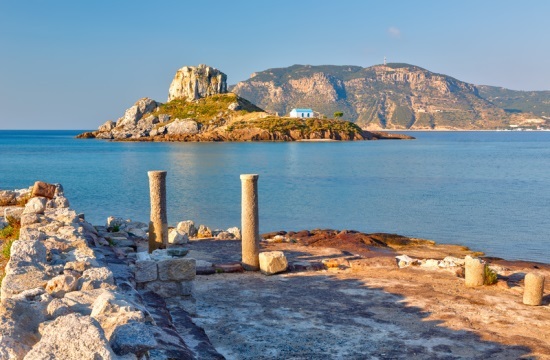 The museum is a very important piece of culture, a jewel for the island of Kos as well as for Greece that is handed over to the people fully restored and upgraded, 60 years after its establishment in 1936 by the Italians. The museum is situated in the central square of Kos, at the heart of the historic and commercial centre of the island. It hosts all the finds from the excavations held on the island until today, mostly those found in the archaeological sites of the Ancient Agora, the west archaelogical site, separate monuments as the Altar of Dionysus, the Odeon and the Casa Romana. The scultures' exhibition also hosted in the museum is a collection of works dated back to the Hellenistic and the post-Roman era and aims to display the most important works of the island of Kos.